East Island Bolero https://www.review-australia.com/au/east-island-bolero-navy/RE19JK012.RENVY001.html For undeniable elegance, style and simplicity, look to the East Island Bolero jacket in Navy. A cropped jacket that blends structure and femininity, this medium weight style is a must-have for events and dressed up work outfitting. With stretch through the fabric, the jacket is fitted through the waist, fastening with a concealed hook and eye closure. With no lapel or collar, the jacket provides a streamlined and flattering silhouette. It's finished with a curved ruffle hem and soft satin lining. For undeniable elegance, style and simplicity, look to the East Island Bolero jacket in Navy. A cropped jacket that blends structure and femininity, this medium weight style is a must-have for events and dressed up work outfitting. With stretch through the fabric, the jacket is fitted through the waist, fastening with a concealed hook and eye closure. With no lapel or collar, the jacket provides a streamlined and flattering silhouette. It's finished with a curved ruffle hem and soft satin lining. East Island Bolero is rated 4.8 out of 5 by 73. Rated 5 out of 5 by HJG: from Lovely in every aspect! I bought this Bolero to wear with the Forever Maxi dress. The look is stunning. Love it! And the best part is, I will get to wear the Bolero over and over again with different outfits. So versatile! Rated 1 out of 5 by Patsy from Has not got here Not got here and tracking shows no progress in over a week!! Rated 5 out of 5 by KKershaw from Classic alternative to a blazer My new wardrobe staple for Autumn/Winter. I wear this over fit and flare and shift dresses and also to dress up jeans! If you're petite like me I recommend this bolero with its rounded front fit in favour of similar straight across styles which seem to cut shorter ladies in half. 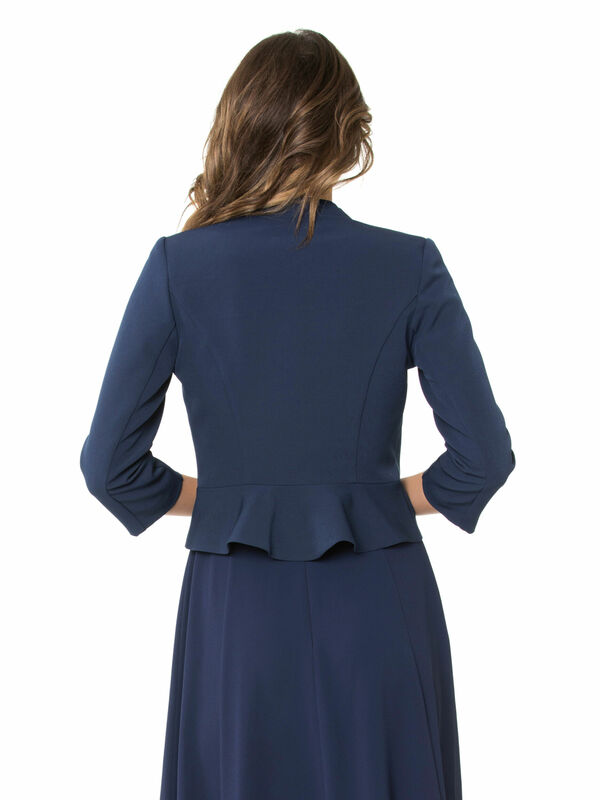 My favorite feature of this bolero-come blazer is the little peplum style ruffle at the back - so femine! Rated 5 out of 5 by FloralFan from Love it I was a little nervous when I bought it as I wanted a short sleeve option to wear over dresses at work but thought this might be too fancy as all the photos were paired with cocktail or formal dresses. I needed not worry! Looks great and dresses up my work attire just the right amount! Rated 5 out of 5 by Astridjo from Elegance & style Very happy with my recent purchase of this very stylish jacket. Will use it a lot. Going to a wedding & fits perfectly with my black dress. Also was most appropriate for a recent job interview & complemented the black skirt and top i wore. Very pleased to get the job. Love Review! Rated 5 out of 5 by Elly from Fantastic fit and elegant style I bought this jacket to match with the sweet chariot dress that i was wearing to a work event. I received many complements and now it has become a regular part of my work wardrobe. Found that the cut is elegant and flattering. I found the fit true to size. Rated 5 out of 5 by Arnie.007 from Classy little jacket Love this little jacket. Can wear over a nice little dress to dress it up or with a cami and pants for a more corporate look. I love the little peplum detail on the back, and the 3/4 sleeve/ light material make it a great option for that summer suit look. Rated 5 out of 5 by Sue2018 from Good fit, well-made and quality fabric. Good fit, well made, quality fabric not flimsy and cheap looking and goes with just about everything. Able to wear as formal over evening dresses or as work wear. Bought in navy in store and blush online as they sold out in store in the blush colour.